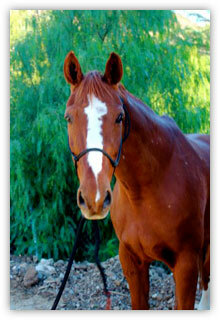 Galaxy is an approximately 28 year old Holsteiner Warmblood. He is our gentle giant at approximately 17.2 hands! He is a sorrel color with a wide white stripe on his forehead and a white sock and white stocking. Before Galaxy came to us, he was a jumper who actually qualified for nationals jumping over 4 feet! He is very affectionate and loves getting groomed. He is often very itchy, so he loves getting curry combed. Galaxy got his new name of “Crystal Vision”, from the generous people of the EMPLOYEES COMMUNITY FUND OF BOEING CALIFORNIA who have been sponsoring him.